Cats and dogs are very curious creatures. They walk around your home and yard, sniffing this and tasting that. While most of the time their curiosity is harmless, it’s not hard for your pet to accidentally eat something poisonous and end up very ill.
March 16th-22nd marks National Poison Prevention Week, which provides information about poisonous items in your home so that you can protect your pet. Many items such as human medications, household cleaners and even some plants are toxic and can make your pet sick. It’s always easier to prevent a poisoning than treating one. So, here are some ways to help protect your pet from eating or drinking something harmful, during National Poison Prevention Week and always. 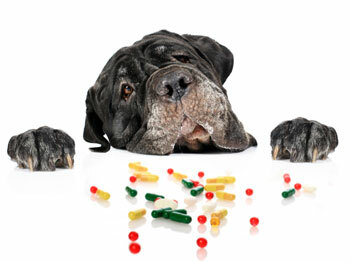 Any medications: Human medications are very dangerous for pets. In fact, even aspirin can cause severe liver failure in your pet. When you take a pill, don’t leave the pill you are going to take or the rest of the container out on the counter. Make sure all your pills are on a top shelf in your home. Medicine cabinets of course do the trick, but if you don’t have one, try using a kitchen cabinet. Food: You have heard that chocolate is fatal to pets; however, you may not know that healthy foods, such as grapes, are actually very toxic as well. Even though the exact reason for the toxicity is unknown, grapes can cause kidney failure in even the smallest amount. Sugarless gum is also a big no-no for pets, as it can cause a drop in blood sugar levels and also liver failure. The bottom line, feed your pet only those foods that are specifically made for dogs and cats and steer clear of anything you aren’t quite sure about. Household cleaners: This one may be a no-brainer. Just like in humans, drinking a household cleaner can cause your pet to become very ill and even death. However, knowing how to deal with spills and stains with pets around may be a bit of a challenge. How many times have you left a stain or spot on your carpet, upholstery or countertop soaking in solution? For many, this occurs a lot. Unfortunately, your pet wants to check it out. While walking around sniffing at your spot treatment, your pet can step in the cleaner and lick his or her paws, which can cause severe sickness. When cleaning, try keeping something between the stain and your pet like a gate or a door. Antifreeze: Probably one of the most common pet poisons is antifreeze. The U.S. Humane Society has estimated that around 10,000 cats and dogs die each year from antifreeze poisoning. One of the best ways to keep your pet protected is to switch to a propylene glycol based antifreeze which is less toxic to your pet. Also, don’t let your pet wander the roadways and streets which may have traces of this deadly solution. Additionally, make sure to store safely any antifreeze in your garage if your pet goes in there. Houseplants: There are a lot of houseplants that look beautiful, but can be deadly to your pet. Popular plants such as the Easter lily, poinsettia, and chrysanthemums can cause mouth and skin rashes or vomiting. Before your next plant purchase, check this list to see if the plant want is toxic. Keeping your pet safe is a full time job. However, limiting your pet’s exposure to many potentially fatal items is key to preventing future accidental poisonings. If you suspect an accidental poisoning, you must treat your pet immediately. Call a poison prevention location, or your veterinarian, or take your pet to an urgent pet care facility or to your veterinarian. If your pet has been poisoned, take the proper treatment steps provided to put your pet back on road to wellness.